8th grade students are presenting the results of the artwork created in journalism and art classes directed by local artist Reyna Garcia. Almost three months ago, teacher Alex Escamilla's 8th grade journalism students sat in the art studio at the Cook Arts Center, waiting to be introduced to local artist Reyna Garcia. Some of them chatted while others goofed off, and a few waited uncomfortably as they tried to assess the situation, feeling uncertain about their artistic abilities. They had just been assigned their project for the semester and still seemed uneasy about the task at hand. 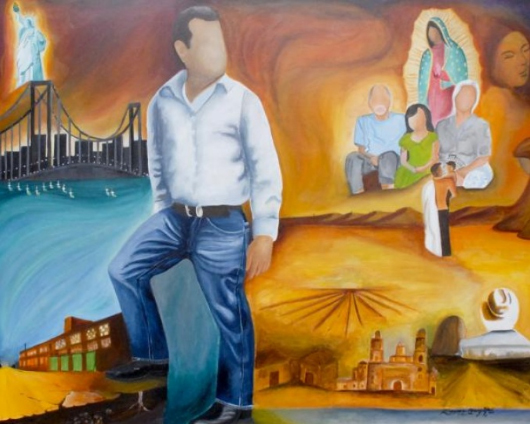 This project wasn’t a regular school assignment that was just about painting or writing, it was about opening up and sharing thoughts, opinions and even personal experiences on the topic of immigration. Because the topic was so relevant and personal for almost every student in the room, it quickly became obvious that a certain level of trust needed to be formed in order for the project to be a success. The extremely personal and relevant subject matter of Garcia’s artwork made her a prime candidate to work with Escamilla’s 8th graders: not only did she clearly have experiences and opinions of her own on the subject of immigration, but she and her artwork stressed the issue of hope, which seemed like something the students desperately needed to be reminded of. When Garcia finally introduced herself (in Spanish) and let the class know that she herself was from Mexico and came here to pursue dreams of a better life, the tension in the room dissipated. “I understand how the students feel,” she said. 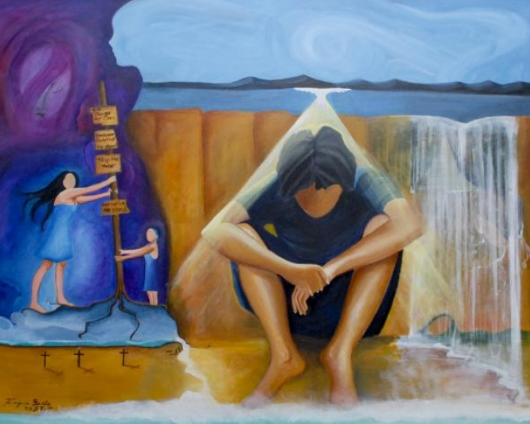 “After some of the people I know were deported, my life changed a full 360 degrees.” She showed them some of her paintings that depicted difficult emotions and experiences with immigration, and emphasized that hope was at the core of all of it and that it’s the real message of her work. Over the next couple of months, Garcia connected with many of the students as she worked closely with them on their pieces. Many of them had never been challenged to create a piece of artwork that was so closely tied to a personal experience and yet had so few requirements. Creating an image that represents your feelings, she explains further, is not an easy task for most people. After many brainstorming sessions, a lot of nudging and encouragement and the assurance that this was a safe place to share thoughts and opinions, their work started coming together. Garcia encouraged them to use color, texture and movement in their paintings in order to visually represent their intangible feelings and ideas. She showed them various techniques and helped students put their thoughts into images and color. A few of the students picked up the brushes and began painting quite naturally, while others raised their hands with discouraged looks on their faces (often because they could not draw what they were imagining). After four classroom sessions and multiple open studio dates, the artwork was completed. Some of the students were truly surprised at what they could do and what they accomplished in such a limited amount of time. Their artwork is being displayed at the Cook Arts Center for the month of June, alongside the articles that were written and published on The Rapidian. 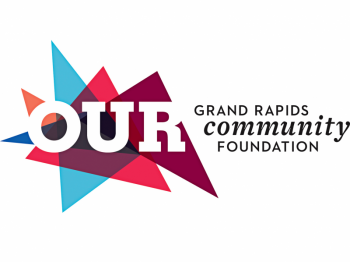 Members of the Grand Rapids community are encouraged to visit the Cook Arts Center to view the work, read the articles, and consider the perspective that these students bring to Grand Rapids. Many of them created this artwork with hopes to start a public discourse on the subject and to encourage the community to seek out more information about what is happening to people here in our own city, and why. 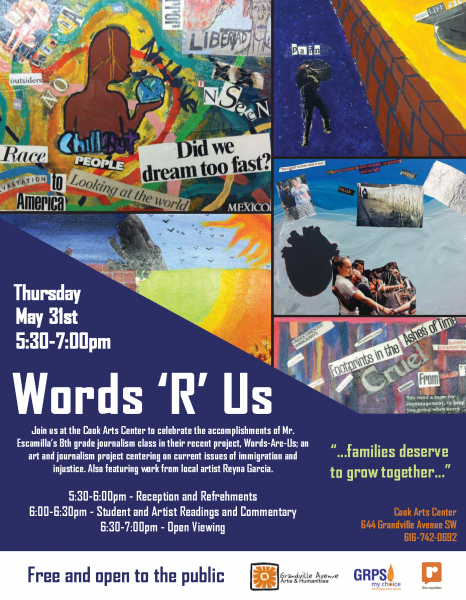 An artist reception for the students is being held on Thursday, May 31st from 5:30-7:00 p.m. at the Cook Arts Center. Refreshments will be provided and the public is encouraged to attend.